NOTE: This post is lengthy and, as usual, I’d strongly caution against trying to scroll through it all in one sitting. I’ll try and make my future posts more navigable and less unwieldy. Credit for the Velociraptor on the front banner goes to Matt Martyniuk. Apart from the hand-drawn anatomical diagrams, none of the images reproduced below belong to me. Use these links to wade through this article: Introduction, Huxley’s paper, What are Theropods?, The Theropod Foot, The Bird Foot, The Theropod leg, Theropod leg to Avian leg. Skip to the meat dammit! I cant help but feel like a ragged and untried fisherboy trying to harpoon a marlin of tremendous proportions whenever I sit down to write one of these articles. I’m ill-equipped and inexpert, I’ll admit, but what I lack in skill I try to make up for in sheer assiduousness. A throng of dinosaur-related journal articles – digitized in luxuriant PDF format and headed with such inviting titles as “TAPHONOMY AND PALEOBIOLOGICAL IMPLICATIONS OF TENONTOSA UR US-DEINONYCHUS ASSOCIATIONS” and “THE ASYMMETRY OF THE CARPAL JOINT AND THE EVOLUTION OF WING FOLDING IN MANIRAPTORAN THEROPOD DINOSAURS” – have made their way onto my computer desktop over the course of the past few weeks. I can’t claim to have read them all but I’m getting there. But how will I go about it? I won’t bludgeon you with a tedious catalogue of names, dates and discoveries. 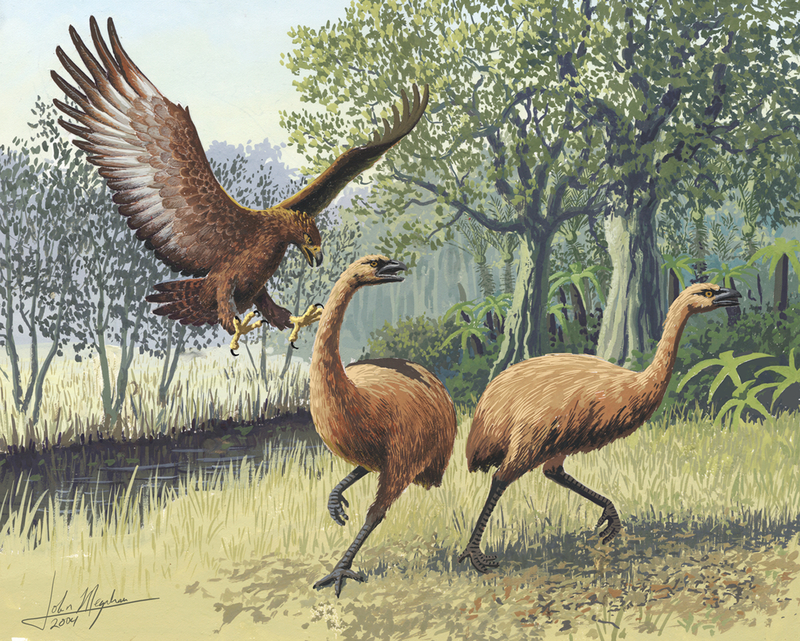 I’ve settled on a far less intensive approach: I’ve decided to use just one scientific paper in particular as a historical starting point for our study – a “springboard” of sorts for discussing the various pieces of evidence for the dinosaur-bird connection. The work in question is Huxley’s 1870 paper titled “Further Evidence of the Affinity between the Dinosaurian Reptiles and Birds“. So how does Huxley’s paper measure up? Well, four sentences in and he’s already – rather dramatically – broken all three of the (modern) “conventions” I briefly alluded to in the previous paragraph. Bizarrely, his first sentence (which ambles on for a whopping 94 words before reaching a period) builds up to a quotation from Dante’s The Divine Comedy. The introductory passages alone include 12+ incidences of the personal nouns ‘I’, ‘me’ and ‘my’. A 1600 word long personal letter from one of Huxley’s fellow anatomists, full of anatomical ramblilngs and the occasional Latin phrase (it could almost make a sci-journal article in and of itself), makes its way into the text. His work bears no hint of the of the Abstract-Intro-Methods-Results format that characterizes modern science literature. You have to hop around the text to connect his conclusions to his premises. 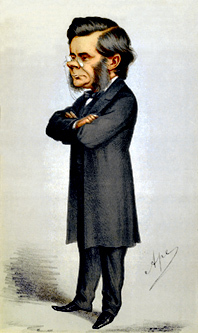 Thomas Huxley in all his frazzle-bearded glory. This should not come as a surprise. A gulf of 130 years separates me from Huxley – science writing has changed a great deal since. Happily, we have dinosaur skulls, neck vertebrae and clavicles galore today. But Huxley’s paper has more than just antiquarian appeal. He was one heck of a scientist. 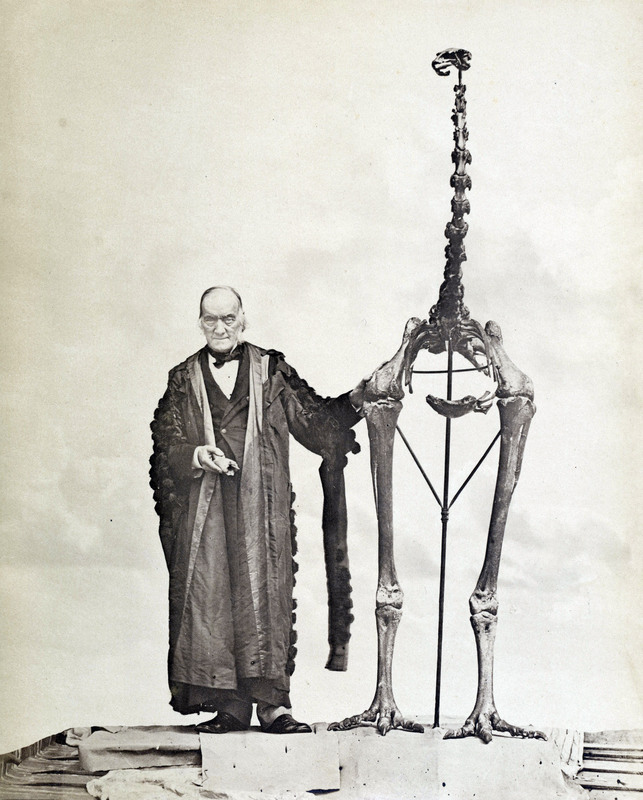 The incompleteness of the fossil record notwithstanding, he rigorously catalogued – as best as any man of his day could – the anatomical similarities between birds and dinosaurs. His observations are, by and large, still true. For this reason, his work shall be the sturdy, if somewhat timeworn, plinth upon which we will build our investigation. We shall augment and greatly expand this foundation with the knowledge of the 20th and 21st centuries as we forge ahead. Huxley had little over a dozen dinosaur taxa to look to for evidence of a bird-dinosaur connection. Fortunately, we have well over 300+ valid dinosaur genera at our disposal today. Does Huxley’s – rather premature – conclusion still hold true? Let’s find out. How do Birds figure within the scheme of Dinosaur taxonomy? As one might expect, not all dinosaur species are equally closely related to the bird clade. The dinosaurian suborder to which the Aves belong is called “Theropoda”, which means “beast feet” (a phrase I instinctively associate with snuggly jungle-themed footwear). The term was coined just 11 years after the publication of Huxley’s paper. The term “Theropoda” refers to a group of dinosaurs that is largely, but not exclusively, composed of carnivorous terrestrial bipeds. Amidst their ranks are such celebrated predators as Tyrannosaurus rex and Velociraptor mongolensis. In fact, pretty much all the meat-eating dinosaurs you can name off the top of your head are probably Theropods. Despite their firm anchorage in the public mind as colossal, roaring Mesozoic harbingers of doom, not all Theropods were creatures of gigantic aspect – many were scarcely larger than the average house cat. Theropod remains usually constitute less than 20% of the fossils obtained from any given dinosaur site. The precise evolutionary relationships between the various Theropod subgroups is a matter of some contention. Nonetheless, I will use “trees” (some pilfered from primary research papers, others salvaged from the footnotes of Wikipedia articles) repeatedly to put the various parts of theropod anatomy into some kind of phylogenetic perspective. 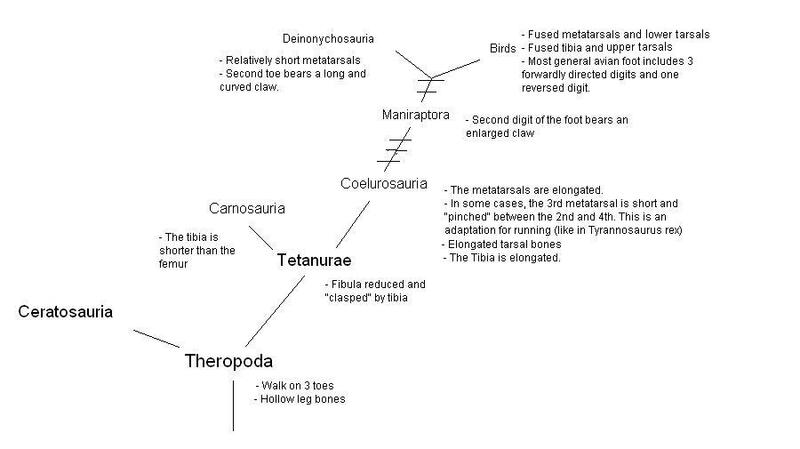 The following diagram deals with the evolution of the Theropod foot over time (in addition to plotting out the basic structure of the Theropod family tree). Click to enlarge. The horizontal lines represent branchings I have chosen to ignore for the sake of simplicity. Don’t be flustered by the exotic-sounding names listed above. Only three are of any immediate import to us. How does the Theropod foot work? The classic Theropod foot sports three weight-bearing toes – the 2nd, 3rd and 4th digits. The first toe is small and – in many cases – raised such that it does not make contact (or makes limited contact) with the ground during normal locomotion on a hard substrate. It also diverted towards the rear in a number of Theropod groups. The fifth digit is either greatly reduced or altogether absent. Each toe connects with a metatarsal.The metatarsal bones are a collection of long foot bones located between the skeletal elements of the toes and the bones of the hindfoot. In humans, they collectively constitute the central portion of the foot. The metatarsus of these dinosaurs is held up at an angle to the ground surface. This is one of the most striking differences between Theropod foot design and Human foot design. Our foot posture is such that the entire foot touches the ground during locomotion (plantigrade) – we share this feature with crocodiles, bears and baboons. In Theropod locomotion, however, only the digits touch the ground (digitigrade) and the ankle is held aloft. You can simulate theropod bipedal locomotion (in a crude and innacurate sort of way) with your own legs by bending your knees and shuffling on the balls of your feet with your heels raised above the ground (avoid performing this exercise in public areas unless you want to be seen as certifiably insane – trust me, I speak from experience). What about the bird foot? Birds are toe-walkers too. Foot morphology is markedly less conserved among birds than among non-avian Theropods. The most general sort of Avian foot involves three forward-directed toes and a reversed first toe. Oftentimes the first toe isn’t raised or reduced – this arrangement gives many bird species the ability to perch on branches. 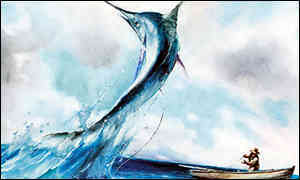 It is seen in prehistoric bird species like Ichthyornis. The General foot form has been circled. Nonetheless – the basic elements of the architecture of the foot are already in place among the Theropods. The foot of the Jurassic bird Archeopteryx and that of a Coelurosaurian dinosaur called Compsognathus bear a striking resemblance (scroll down to the end of this post to see the diagram). The first digit of the Archeopteryx foot remains raised above the ground as in earlier Theropods. 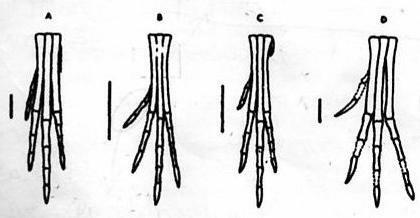 The first toe descends to the same level as the other toes and becomes fully opposable in later bird species as an adaptation for arboreality (eg. 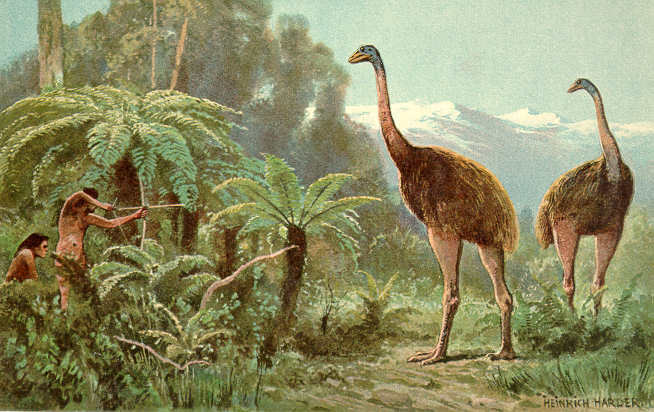 Iberomesornis and Concornis). In birds. the various bones of the lower tarsus and the metatarsus are fused into a single skeletal unit called the “Tarsometatarsus”. 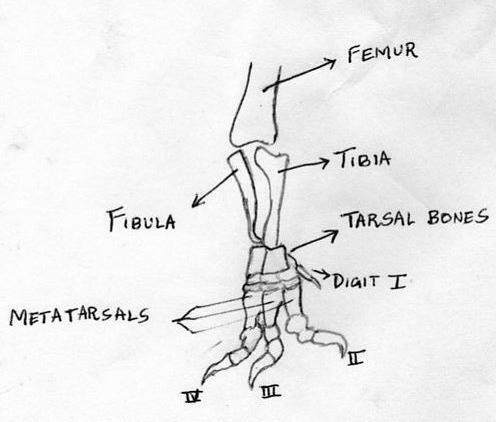 The tibia and the upper tarsal bones are fused to form the “Tibiotarsus”. The various features of bird hind-limb anatomy are sketched out below. The Bird hind foot. 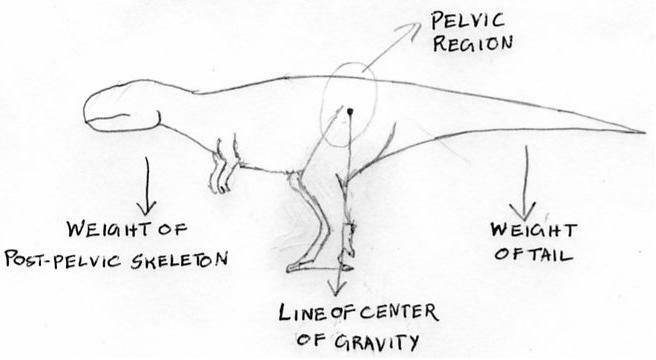 Note the similarities between it and the Deinonychosaurian hindleg diagrammed below. Also, the direction of motion entailed by "Knee flexion" is indicated with an arrow. How does the Theropod leg work? The remainder of the leg is made up of three bones. The tibia and fibula together constitute the lower leg. They run lateral to one another. Among theropods, the Tibia is generally larger than the Fibula. The upper leg bone – or thigh bone – is called the Femur. The head of the femur fits into a socket in the pelvis. It should be noted that Theropod hind-limbs are erect and bear only a passing semblance (structurally speaking) to the sprawling legs of modern crocodiles. Although, interestingly, crocodiles are actually capable of bouts of erect walking. Head of femur (which fits into the hip socket) of a Ceratosaurus with prominent 4th trochanter marked. This is gradually lost in more advanced theropods. Small bony processes called “Trochanters” are found near the upper end of the femur. These are attachment sites for various hip and thigh muscles. Dinosaurs are distinguished from mammals by the presence of a fourth trochanter where the potent-sounding “Caudofemoralis longus” muscle inserts into the femur. This muscle runs from the tail (where exactly is a little uncertain) to the upper end of the thigh bone. So why do I bring up the Caudofemoralis longus (CFL) muscle? Well, because it plays a critical role in the locomotor system of Theropods. It is the chief muscle responsible for retracting the femur during walking and running bipedal motion. Quite simply, CFL – and the muscles allied to it – form a muscular propulsive system of sorts. It is situated in the Thigh-tail region. Most theropods possess long muscular tails to balance the frontal portion of the body and bring the center of mass to the hip region. The nose-down force created by the weight of the body after the hip joint is counterbalanced by the nose-up force generated by the weight of the tail. The Hind limb and tail are interlinked through the caudofemoral musculature (= CFL + a number of related muscular components). The rotational action of the femur, rather than knee flexion (that is, decreasing the angle between the lower leg and the upper leg at the knee joint), is what drives locomotion. Birds, on the other hand, have largely done away with this particular muscoskeletal complex. They have ‘decoupled’ the musculature of the Hindlimb from that of the tail. We shall discuss this in the next paragraph. How do we go from “Beast Feet” to “Bird feet“? – Both non-avian Theropods and Birds are digitigrade walkers – they support their weight on their toes. – The hind limb bones are filled with air spaces (pneumatized would be the fancy word). – Erect stance and gait. – The tibia is thicker than the fibula. 1) Modern birds are knee-walkers. 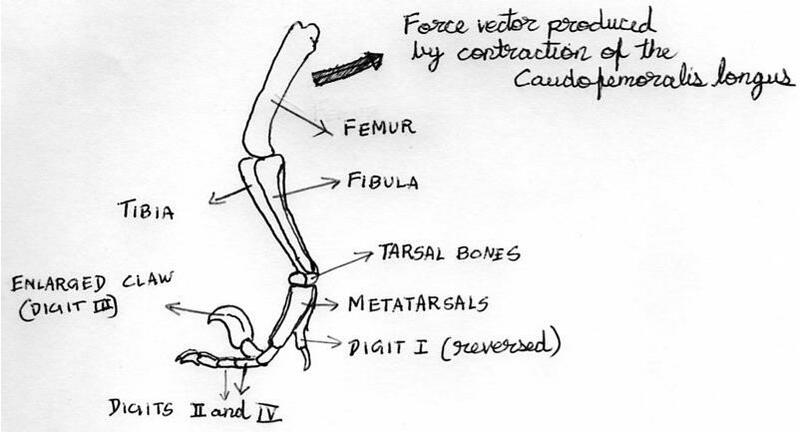 Knee flexion (refer to diagram) is the process that underlies foot displacement in birds. In the Guinea fowl (this shall be our model bird), the femur is held close to the body and is angled at around 35° to the horizontal. 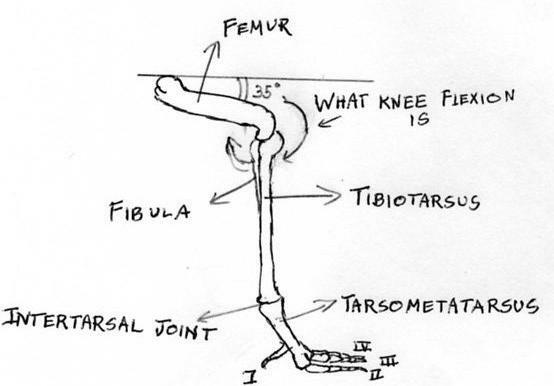 The lower leg (tibiotarsus+fibula) does most of the moving during normal locomotion. The femur barely swivels through an angle of 5° at slow speeds. The lower leg, on the other hand, swings through angles as great as 70°. At higher speeds though, the femur does swing through larger arcs. However, birds – by and large – are anatomically incapable of bringing their knees directly underneath their hips. This is almost certainly not true of the Theropods. Refer to the diagrams if you’re not sure what I’m talking about. The Caudofemoralis longus is greatly reduced or absent amongst modern bird species. It is used primarily for respiration and plays a very minor role in the avian locomotor system. The tail and the hindlimb are, in effect, decoupled with respect to the locomotory process. As stated earlier, Theropod locomotion is more heavily predicated on the movement of the femur (about the hip) and on the activity of the CLF (a tail to femur muscle). So how does one move from hip-based walking to knee-based walking? This transformation appears to be intimately related with one major evolutionary trend: The reduction of the tail. As one moves closer towards modern Aves (Theropoda –> Coelurosauria –> Maniraptora–> Early birds –> Modern birds), a decrease in tail size and the number of tail vertebrae is perceptible. In all modern birds, the tail vertebrae are fused into a single stumpy mass called the pygostyle. This reduction in tail diameter and length causes the center of gravity to shift forward. The Bird balancing act. The feet are positioned further forward thanks to the reoriented limb bones. As obligate bipeds, both birds and tyrannosaurs must have their center of gravity fall between their feet. As I’ve related in the paragraphs above, tyrannosaurs solve this problem with their hefty stabilizing tails. But what of modern birds? Their solution: limb reorientation. The femur assumed a sub horizontal orientation close to the body (it is usually hidden from external view) and the tibia grew in length. This positioned the feet further forward underneath the center of mass. Thus, the hip-based motion of the earlier Theropods transitioned into the knee-driven motion of modern Aves to deal with the myriad balance issues that accompanied tail loss. Knee walking allows Birds to move on two legs without pitching nose-downward. Without the need for powerful femoral retractions, the CLF diminished in size and the fourth trochanter disappeared (among the maniraptoran theropods anyway). The flexor muscles of the knee, on the other hand, grew in size. In an interesting evolutionary parallel, the pterosaurs – a group of distantly related flying reptiles – also lost the 4th trochanter. 2) The tibia, fibula and metatarsals lengthened considerably over the course of Theropod evolution. This is generally associated with increasing speed. This is especially true of the forms leading up to modern birds. 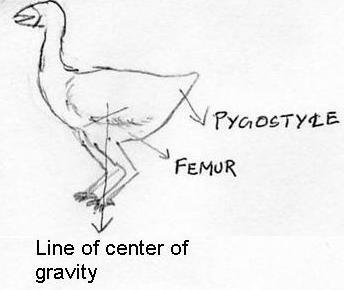 The lower leg is longer than the thigh (refer to diagram) among living aves. As for some less interesting changes: The beginnings of the tarsometatarsus (fused metatarsals+ lower tarsals) appear during the mid-Cretaceous in forms like Iberomesornis. The fused tibiotarsus is primarily seen in birds of modern aspect (Neornithes). The earliest Coelurosaurs possessed long, narrow metatarsals. In some groups (notably the Tyrannosaurs and a group of bird-relatives that I referred to in the first post – the Troodontids) a cursorial (running) adaptation called the arctometatarsus evolved. Here the third metatarsal was slender and “pinched” by the flanking metatarsals. 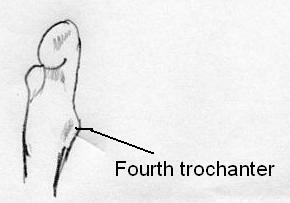 The third toe is ordinarily the first digit to make contact with the ground during locomotion. When it does, the arcometatarsus acts as a shock-absorber of sorts, preventing stress-related injuries to the foot. The feet of the Theropod Compsognathus (C ) bear a striking resemblance to those of Archaeopteryx (B) – a creature that is generally accepted to be the earliest known “Bird”. The feet of various Theropods. B- Archeopteryx, C - Compsognathus. Borrowed from John Ostrom's 1974 paper titled "Archeopteryx and the Origin of Flight"
However, Archeopteryx is not a ‘modern’ bird by any stretch. Its hind leg is primitive and relatively unspecialized compared to most of its successors. The scene is set, but the Theropod hind limb has a some distance to go before it can be called a “bird leg”. The development of the tibiotarsus and tarsometatarsus (which developed much later) still haven’t been discussed in much detail. I will cover it in further posts on Bird evolution (not in this series though). However, we have covered some of the major functional changes in hind-limb anatomy – and I‘m content with that. *Or sparingly at the very most. ** I came across this post at tetrapod zoology that might throw some water on that idea. ***There are some exceptions to this statement. Off the top of my head, I think the 5th digit is modified into a defensive spur in Chicken. It might also be worthwile referencing a paper by Stephen M. Gatesy titled “Caudofemoral musculature and the evolution of theropod locomotion” which was the source for much of the “Theropod leg to Avian leg” section.